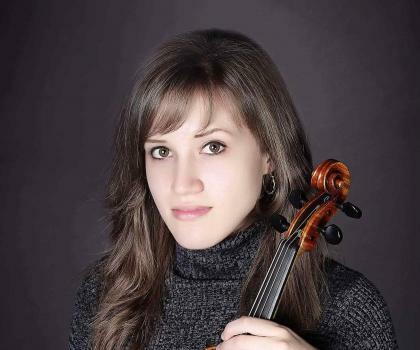 Violinist Emily Kruspe is no stranger to success. The 26-year-old artist, recently named the newest member of the award-winning Rolston String Quartet, also made this year’s CBC 30 Under 30 list.In the same month that Emily joined the Rolston String Quartet, she completed her music studies at The Royal Conservatory’s Glenn Gould School (GGS). She was among group of six artists from around the world selected for the 2017-18 Rebanks Family Fellowship and International Performance Residency Program. This one-year, full-scholarship program offers private study with exceptional faculty and guest artists, concert presentations, career coaching, marketing training, as well as a funded European residency. As a Rebanks Fellow, Emily’s days typically included lessons, practice, and working with a collaborative pianist. Mornings often started with lessons in Alexander Technique, a well-known discipline among musicians that promotes healthy movement and body awareness. Applications for The Rebanks Fellowship Program open in October. The Royal Conservatory is grateful to the Rebanks Family and The W. Garfield Weston Foundation who have made The Rebanks Family Fellowship and International Performance Residency Program possible through their generous support. The Glenn Gould School is also supported by funding from the Department of Canadian Heritage through the Canada Arts Training Fund, and from the Ontario Arts Council.